Where are you from? Niagara Falls Ontario Canada and currently living just outside of Louisville Kentucky. How long have you’ve been Bartending? I started tending bar while in High school. I was 18 years old. The math works out to 26 years in the hospitality industry. And Flair Bartending? My first bartending competition was 21 years ago in 1994. Tailgate Charlies in Hamilton Ontario. I was blowing fire back then. It was a great trick to take the win back then. Where do you work? I am the Director of Beverage Applications for American Beverage Marketers the creators of Finest Call and Reál Cocktail Ingredients. Tell us about how the creation of the Flairco practice bottle came about? 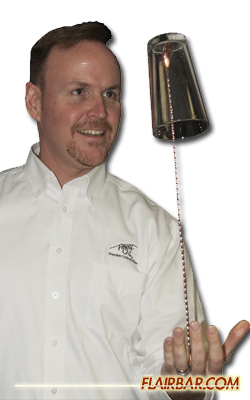 I invented the Flairco Flair bottle after working for the Ripley’s Believe it or Not chain of museums. I used similar techniques to that were used to create props in the museum to create the Flairco bottle. The saying “Necessity is the Mother of invention” is very true here. I knew that there had to be a smarter and safer way to practice. I went looking for answers to the question. I had considered Nerf, and soda bottles, I was throwing everything up in the air to try and recreate the feel of a glass bottle. When I finally brought the two concepts of a liquid plastic and light plastic liquor bottle together I knew I had something. After that there were years of development and prototypes. The bottle evolved over time to what it is today. With that there are many knock off bottles now available and they still have not reached the quality that the Flairco bottle has. What other bartending inventions did you help create? After watching many of the competitive bartenders practicing speed rounds off of ironing boards and over turned hotel dressers I began work on a portable bar unit. 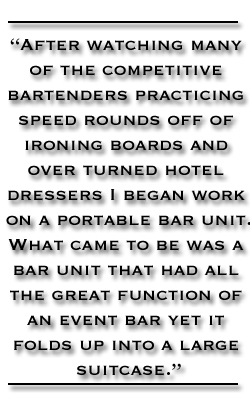 What came to be was a bar unit that had all the great function of an event bar yet it folds up into a large suitcase. Set up and folded up it can be rolled around the room or transported in the trunk of a car. Before the Internet and all of it’s free tutorials I was among the first to produce video training material for other bartenders as well. I produced two VHS tapes for Flair and then when the DVD became popular I wrote and produced three Flair training DVD’s and another training DVD covering magic for bartenders. I have also invented the Floating Shaker tin. This is a fun tool for performing magic behind the bar. 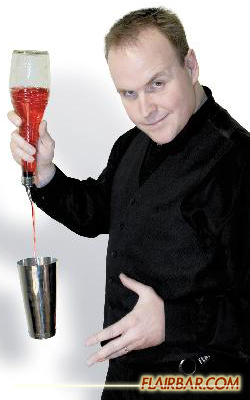 Many Flair bartenders have had great success with it including Rob Turek who performed it on the Dr. Oz Show and Dwayne Sawyer from the LVFA recently performed it on a Milk.com commercial. I think we might also see it on AGT this season. 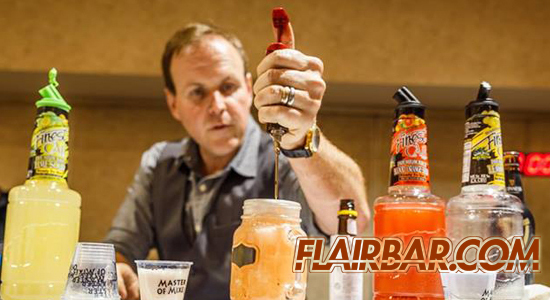 Beyond the Flairco products, how else have you evolved the craft of Flair bartending? My first bartending competition was in 1994. From there I was hooked. Since then I have competed in, organized, judged or Emceed hundreds of competitions. As a founding member of the Flair Bartenders Association I was able to be involved in the start up and growth of Flair. In the ten years I spent on Flairco I trained many groups of bartenders. 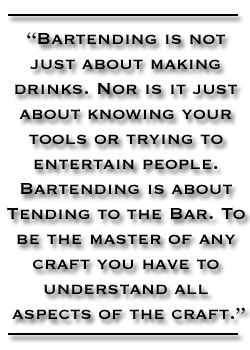 Many of these bartenders are still competing or they have become successful in other areas of the industry. Now that I have crossed over into the executive management sector I am still involved with many competitions as a sponsor of the event. Many of these events still include me as an Emcee or judge. I have been involved in Flair at a high level for a long time. I still have dreams of it finding its way back into the mainstream. This year could be a big year for Flair. Lets wait and see. Your inventions have changed how bartenders practice their craft around the world. Can you share a story about this? We started Flairco just before the Internet starting connecting people. We were amazed at how quickly information could travel around the world. One of our first over seas phones calls was from the Netherlands. Last I tracked the progression of the Flairco bottle we had 50+ distributors in 27 countries. I have no idea how to track the bottles themselves. 20 years ago bartenders did not practice the craft. No one would practice bartending. 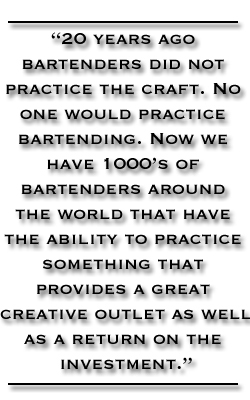 Now we have 1000’s of bartenders around the world that have the ability to practice something that provides a great creative outlet as well as a return on the investment. Bartenders are now practicing their way to better money, better opportunities and an ability to travel the world. Many bartenders have practiced their way into great jobs in the US and around the world. What is your favorite Flair Bartending competition and why? Honestly, it has not happened yet. Perhaps I am being cynical but I am still awaiting on an evolution of the craft. I sound like a broken record on this and I have bent and worn the ear of many people on this issue. For too long we have had competitions that only celebrate the skill of throwing bottles and ignore the other aspects of the craft. I am anxious to see a new age of competitions that do not allow for spills and drops. Competitions that reward a quality made drink presented in a reasonable amount of time by a fun character behind the bar. My favorite competition will be one where showmanship and personality are equally or more important than the Flair itself. The quality of drink will be as important as not dropping anything and one that does not take ten judges and a set of Apple store employees to work out the scoring on. In short I am looking for the bartender on stage that can make a tasty drink, be interesting and entertaining to watch and does not drop anything. We should be able to judge competitions with three judges and buzzers. No math at all. You have judged world ranked bartenders from all over the world, what advice would you give competitors to score better in Flair competitions as well as Mixology competitions? Ask yourself this question before you sign up for the competition. Why do you want to compete in this event? Do you want to show off your latest greatest moves, or do you want to do well in the competition. My best advice is to read the rules through many times. Structure your performance to allow you to gain many points in all of the categories and not just one. Too many competitions are lost to deductions. I have seen great bartenders loose because they felt they needed to push themselves and they drop or break. Who do you look up to in this Sport? I admire all of the guys and girls that do this day in and day out. The every day bartenders that flip, shake and spin all week. I admire them when the last thing they want to do is another Showcase and they still smile and entertain. I also admire the guys that are just getting into it. The guys that are building up the guts to enter and make their first Flair bottle purchase. The guys that get up early and work hard are the ones that I look up to. Embracing the unknown is a scary yet rewarding adventure. The average person does not understand this. Tell us about your position with American Beverage Marketers? As the Director of Beverage Applications with American Beverage Marketers my role is to assist in the development of new products and then create cocktails and cocktail applications with them. In short my job is to create tasty easy to replicate cocktails that increase sales and profits for bars and restaurants. With this I have the freedom to experiment with many applications. From simply shaking and straining to smoking drinks, molecular mixology and just about anywhere else I think you can take drink making concepts. I then travel with our sales team demonstrating cocktail applications and assisting with the implementation at the bar level. How has being an award winning Flair bartender helped you in your role now? I cannot describe all the benefits that have come from preparing for a bartending competition. There are many. I suppose the most important aspect for me is in preparing for presentations. Being on stage with Flair events has given me many of the skills I use in my day to day role as a presenter. I can say that it is the times where the Flair shows did not go well and when I had to improvise that have provided me with the most skills today. If I prepare a presentation today and for some reason, moments before the presentation everything falls apart. I know that I am still going to do just fine with the presentation due to my experience in front of an audience. Currently you present seminars on many aspects of bartending. Mixology, Flair and Magic. How important is it that a bartender learns other aspects of the trade? Bartending is not just about making drinks. Nor is it just about knowing your tools or trying to entertain people. Bartending is about Tending to the Bar. To be the master of any craft you have to understand all aspects of the craft. There are as many “Master Mixologist’s” that cannot entertain a bar guest as there are “Flair bartenders” that cannot keep a guest with a great original cocktail. No aspect of the craft can be dismissed as less important than the others. If you want to truly master your craft you have to understand all aspects of that craft. What is something every bartender should know for their first shift behind the bar? “Bartending is an old and honorable trade.” (Patrick Gavin Duffy). You will get as much out of this trade as you put into it. This job can be a very rewarding career that takes you around the entire world. It will be everything that you make it. Before you start your first or any shift. Forget your outside world, focus on what is in front of you and smile your way through it. A positive attitude will create the opportunities for you. What are your thoughts when you hear remarks about Flair bartending or craft cocktails slowing down service? At its root Flair bartending was created to increase the speed of service. Unless you are in Vegas, Flair should never get in the way of moving drinks across the bar. As for crafting cocktails, it is rare that I have received a cocktail that tasted so good that it was worth a long wait. If intentionally making the guest wait is still somehow part of the bars philosophy they should offer me a free bottle of beer while I am waiting for that $15.00/15:00min cocktail. You were a founding father of the Flair Bartenders Association. How do you feel the FBA contributed to the evolution of Flair? The intention of the founders of the Flair Bartenders Association was to unite all the bartenders that had a passion in entertaining guests from behind the bar. The FBA was great at doing that. The FBA was created before the Internet became what it is. There were no Facebooks or any other ways to connect. The FBA was a great program that united many and set standards for bartending competitions. This gave the bar managers and owners a starting point that helped keep local competitions at a similar level. What are your thoughts on bartending competitions today… what would you change and why? I would like to clean the slate and start fresh. Make the competitions about being great bartenders with a balance of skills. Some Flair, some Mixology and no drops or spills. I have watched Flair competitions where the bartenders have spent weeks practicing and they spend the entire show chasing bottles on the ground. On the other hand the Mixology competitions lack the excitement of Flair yet they showcase an attention to the cocktail that the Flair guys do not. Where the Flair guys are wild and loud with dirty old t shirts the Mixo’s are so intently focused on the drink it is tough to get them to smile. There has to be a middle ground where making great drinks is fun and entertaining while not risking drops and spills. 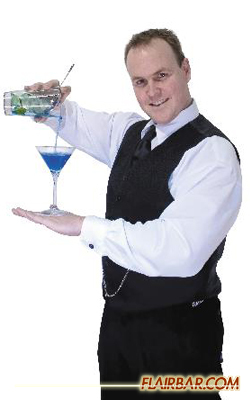 What is your advice to some of the new bartenders wanting to learn Flair Bartending? Learn to make a drink first. Learn cuts and pours first. Master those without spilling. Only after these are mastered should you move onto having a bottle leave your hand. Treat the evolution like a martial art. So many want to rush to the end and start juggling. When they get on stage we immediately see that they did not learn the basics. When the bartender is spilling and cannot pour the drink itself it negates any need for him to be up there flipping bottles. Flair bartending is a fancy way to make drinks. I’ll say it again. The quality of the drink has to come first. Why do you Flair? There are times when it is faster to toss a glass behind your back while your setting up glassware so that you can turn off the draft tap with the same hand you throw with. With this Flair is a faster way to bartend. Flair also catches the eye of your guests. It gives them a confidence that you are good at what you do. If I can quietly catch a bottle while not breaking from service I give off a sense of fun, skill and confidence. It attracts guests to my bar and helps me to stay in control of the direction of the night. Practicing is a creative outlet that allows your mind to be free of daily business. Alan Mayes said it right. When you are juggling three or four bottles in the air. You don’t have time to think or worry about anything else. What are your thoughts on Flairbar.com and what would you like to change about it? The interviews are too long and it needs to be part of a printed magazine. Perhaps we could have just picked part of my life story. I say this in jest. I can’t wait to see the TV version of the online magazine. What is your favorite American Beverage Marketers flavor? My favorite American Beverage Marketers product is…the next one! Seriously our new Cherry Reál is awesome. Pumpkin Reál was the best before that. Then there was Blood Orange Sour mix and Premium Lemon Sour mix before that. All of the American Beverage Marketers products continue to improve and evolve. That is one of the things I enjoy most the company. You never know what is coming next and they continue to improve with every new product. This is consistent in the entire line since day one. We continue to source out higher quality fruit and growing regions and new food science technologies that make our products better. 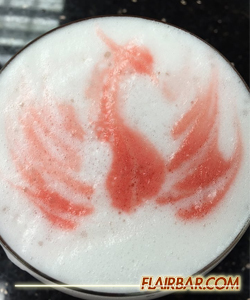 What is your favorite cocktail you created and can you share with us how to create it? Here is a brand new one. Not my favorite but I like it for many different reasons. Combine ingredients in a mixing glass filled with ice. Shake very well and strain into a champagne coupe cocktail glass. It is an incredibly light cocktail with great floral notes and mouth feel. How are you doing today?I want to make some inquiries about Bartender Training.please let me know if your facility can accommodate 12 people in the Month of September 2015, We are coming from South Africa and i also need your reply on the below questions. 1* The number of number of people you can train at once? 2* Your convenient time/per day to start the training with the group and i also want to know if 2 weeks is enough for the training? 3* Your cost of services per person? I awaits your reply so i can work on the whole information and get back to you with any more information needed to enable us secure the space for the Training. Thanks Gavin and great hearing from you brother. Wow. I couldn’t agree more. One of the best FlairBar articles I have ever read. Dean is an innovator, a bartender and an entertainer. Would love to have your help both running and judging two new competitions which address a lot of the comments in this article. Rob Husted, great work on the questions for this interview.